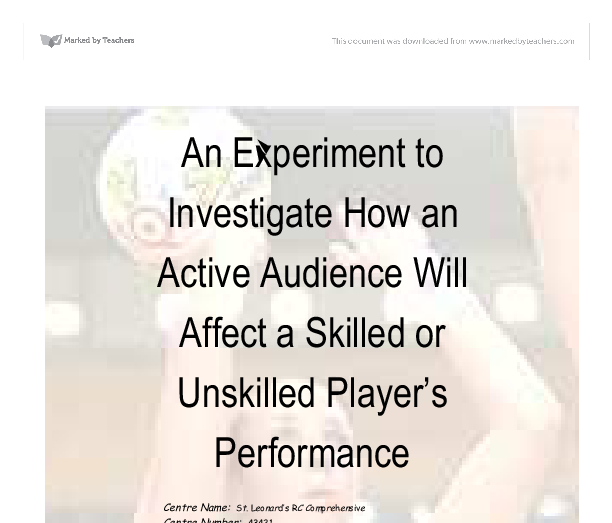 An Experiment to Investigate How an Active Audience Will Affect a Skilled or Unskilled Player's Performance Centre Name: St. Leonard's RC Comprehensive Centre Number: 43421 Candidate Name: Sarah Davey Candidate Number: 6767 By Sarah Davey ABSTRACT Empirical Evidence used for this experiment was that of Triplett, Michaels et al. and Pessin, which all look at how an audience can affect a performance. Pessin and Triplett lacks ecological validity, due to unsporting relation, whilst Michaels et al. can be generalised more with this experiment, and is based on this. The aim of this experiment was to investigate whether skilled netball players with an active audience, would score more goals in 1 minute than unskilled players with an active audience. 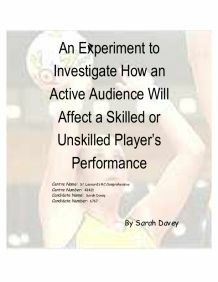 The Alternative Hypothesis of this experiment was that, skilled players would score significantly more netball goals in 1 minute, with an active audience than those who are unskilled. An experimental method was employed and an Independent Measures Design was chosen. The end T-Score was 18.4, and the Critical Value was 1.734. INTODUCTION INTRODUCTION: The generality of the investigation is to do with Sports Psychology. The main part of the experiment is based upon "Social Facilitation", which leads onto the "Dominant Response". "Social Facilitation" refers to the way in which the presence of other people may improve our performance. This presence could be other participants or an audience. The "Dominant Response" refers to the behaviour we are most likely to display under a certain given situation. When a player has learned and practiced certain behaviour or is highly skilled in a certain sport, then this is known as their "Dominant Response". In the case of a world-class netballer, they would have practiced their sport and the behaviour that matches it in front of other members of the team, coaches and also in front of an audience when in competition. And in a match, this observance of other members, coaches and especially an audience, will enhance and facilitate their performance. ...read more. Deception is an ethical issue, which should be kept in line with. The participant must not be deceived, yet can be to an extent to not give the experiment or investigation away. Therefore, to control this in the investigation, participants will be told, "Hi, I'm Sarah. I'm a psychology student investigating Sports Psychology. Would you be interested in taking part and helping with my results? If you do, you have the right to withdraw at anytime, your scores will be confidential and it should only take a few minutes." The level of probability is P=<0.05 as this is the most commonly used level in psychology and helps to avoid type 1 and type 2 error occurring. PARTICIPANTS: The identified target population is 16-28 year old females from the Stockton area. 20 participants are needed to make sure that my results are reliable. 10 of these will be skilled, and the other 10 will be unskilled. The 20 participants were selected by opportunity sample from the target population. APPARATUS: * Netball post- this was chosen because it was essential. A Basketball ring could have been used with using basketball players instead of netball players. Yet a netball hoop is harder to score a goal, therefore spreading the skilled from the unskilled easier via more or less practise. * Netball- This is used due to the choice of choosing the game of netball instead of basketball * Stopwatch- Needed to record time and length of experiment per participants turn. This is more effective than counting or watching a clock. * Chalk/Tape- Used to help set out the experiment and where the participant must stand. TASK/TASK CONSTRUCTION: Participants will be asked to start on the chalk line and take a shot. An assistant will be situated behind the goal and will catch and throw back the ball. The participant must keep behind the line and must score as many goals as possible. ...read more. The opportunity sample is also biased as not all people were kept in mind and all players taking part, were all trained in the same way, which may affect their performance and thoughts to an audience. It also doesn't include male players in the experiment, therefore biased to females, who may react differently to males in front of an audience. Males in an audience, may also have affected a female's performance if there were to be males in the audience, this experiment did not contain males. The experiment also lacks ecological validity as it is not taking part in real game situations and they know that there are being watched and analysed. To improve this research, a larger scale of participants would be used, both males and females, along with a larger age range throughout the years, instead of 16-28 year olds as these younger minds may be more confident, less confident, or may stay the same in front of an audience, yet this may depend on the participant. This then means that the study and its results can be generalised to the population as a whole. Further developed research could be that the experiment would have separate age groups instead of skill levels. This would see whether young players perform differently to how older players perform. The young age group could be 16-30 year olds, and the older age group could be 40-55 year olds. Both male and female participants could be involved instead of just females as females may act or perform differently to an audience. A larger audience may help make the results more reliable as they will be seen, heard and have a larger affect on the participants. Another style of research could be on how males may perform differently to females in front of an audience. This could be in a form of past research, studies and their results. Another, possibly more effective style of research into how males may perform differently to females, may be having a side experiment looking at these factors, onto this one. ...read more. Kathryn's strongest points were in Arbeit Macht Frei when she was being a begging child, she made her eyes look pleading and her body hunched over. This was so effective and yet she quickly got into this character making the piece very concise. Through out the play she rejects Jorgen and his middle class lifestyle, she clings to her honourable past with which her father provided "What a life she had back in the general's day!" This may show the audience more of the way that she wants to be free and that the marriage is of just convenience for financial support. This continuous jolty but smooth movement made her seem robotic and almost un-real. She also seemed quite cat like, in the way that she prowled around as if hunting for someone to pounce unexpectedly on. The most effective and noticeable thing was the constant movement, pose, movement, pose etc. And, to the film goers of the time there may have been complaints of films being too similar. Studio Specialisation Through a need to quickly make movies, which was accomplished by working in the same genres, and as a result of the writers, directors and stars on its books, each studio became specialist in certain film genres. Controls I will be controlling whether or not an audience is present or not. The groups will be told the same thing and the task will be carried out in the same room. Measuring variables The task will be timed therefore a time will be recorded. But, once we got started it went really well. No-one forgot their lines that I noticed of, and everyone stayed in role. Laura Sell made one mistake but me and Samantha came on and took over and covered up. No-one noticed so it didn't really matter. The first area, is upstage, representing "Jen's" mind, and the disturbing memories and voices that taunt her, and turmoil within it. The second are is downstage, representing the sardonic turmoil of reality she must face. This uncovered a problematic question. away they could sit facing sideways with their heads tilted to the opening. I will use an old form without any varnish on it so that it looks more dull and disused.